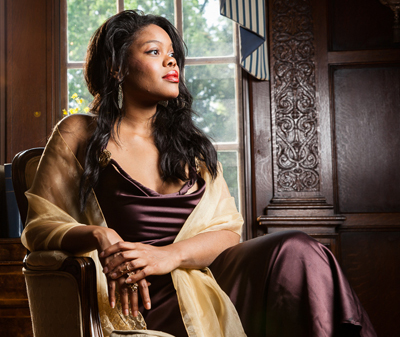 Strathmore Artist in Residence Cassandra Allen combines the syrupy vocals of Sarah Vaughan and Ella Fitzgerald with Afro-Latin jazz rhythms and Mediterranean folk music when she takes over the Mansion at Strathmore for her residency concerts on Wednesdays, March 9 and 23, 2016 at 7:30 PM. At her second performance, Cassandra will debut a Strathmore-commissioned piece deeply rooted and influenced by her traditional jazz and classical background. Cassandra’s performances are sponsored by Mrs. Patricia Haywood Moore and Dr. Roscoe M. Moore, Jr. For more information, call (301) 581-5100 or visit www.strathmore.org. The singer-songwriter-arranger incorporates a mélange of styles into her music, experienced during her travels performing and studying in Italy, Russia, the Czech Republic, and the country that most resonated with her - Spain. She combines these culturally-specific genres with her jazz and operatic training to create something new and entrancing. Some of Cassandra’s most notable performances to date come from her time in Spain, and include opening the Tennis Open 500 Valencia in a nationally-televised performance before a crowd of more than 5,000; making her jazz debut at the renowned Jimmy Glass Café Valencia, where she became a recurring guest artist; and performing her medley of spirituals at Valencia’s Palau de les Arts Reina Sofia. Founded in 2005, the Strathmore Artist in Residence program was created to support the transition from amateur performer to career artist. The program has mentored 58 young musicians, ages 16-32. Each year through a competitive selection process, a class of six is chosen and benefits greatly from the support of participating mentors and musicians, 30 hours of professional development seminars, and extensive performance opportunities offered throughout the 10-month program. The Artist in Residence program is part of Strathmore’s Institute for Artistic and Professional Development.